L'Oréal Professionnel with Somptueux 2012 will be interpreting global trends to create the dramatic looks for this season using Majirel color treatment at Collection. Meet the L'Oreal Professional Majirel family! 100 shades with natural to vibrant permanent color results! "Majirel is a great color as it covers very well and achieves the desired color. With coloring, it also conditions hair and gives a smooth and silky look and shine!" L’Oréal Professionnel offers you the innovation, trends and techniques you need to achieve beautiful color every time. 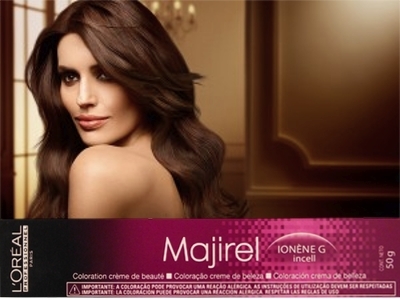 Majirel Hair Colors are permanent and provide perfect coverage of up to 100% of white hair. 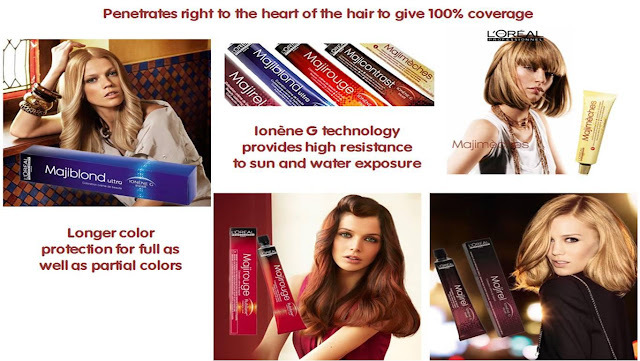 Ionène G technology provides ultraconditioning to hair along with high resistance to sun and water exposure. 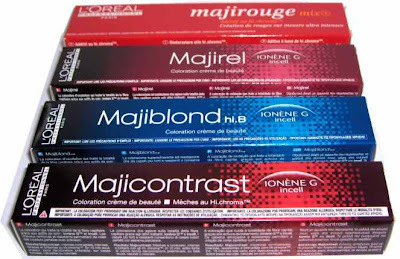 Majirel provides longer color protection for full as well as partial colors. Majirouge: 5 shades for adventurous ones desiring pure, vibrant and intense red and copper shades. Pure and sophisticated red tones with 100% coverage of white hair. Ask your professional hairdresser for an in-depth colour consultation to determine your perfect shade. Ionene G restores, protects and continuously conditions. Incell Complex strengthens and reinforces from the inside out. MajiBlond ultra: Achieve a glamorous, eye-catching blonde! From icy, platinum shades to pearly, champagne or golden tones, there is an unlimited range of stunning blonde choices for you. MajiBlond is a long-lasting, durable permanent colour that lifts up to 4 1/2 levels of clean lightening, beautifully even from root to tip for pure, cool reflects or luminous warm shades. Majiblond has a complete palette of lightening shades, formulated with the hi.blond system for an optimal result: super-lightening blondes from the coolest neutral shades to the most radiant shades. MajiContrast: If you have dark natural or dark coloured hair and you desire a visible colour result, then MajiContrast is your go-to product! MajiContrast has a range of shades with hi.chroma technology to create partial colour effects which are intense and contrasted on natural or coloured dark hair. Hi.Chroma colorants allow visible colour results on dark natural or dark coloured hair.